A centerpiece you can eat? Most certainly! 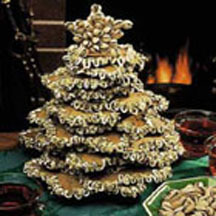 Dress up your holiday table with this dazzling, edible cookie tree and you'll have dessert prepared ahead of time. Cream butter in large bowl. Beat in sugar, egg yolk and extract. Add flour and 3 cups pistachios, a portion at a time. Roll out portions of dough on floured board to 1/4-inch thickness. Cut into oval "cloud" shapes of three different sizes, making equal numbers of each size. Gently drill hole slightly off-center in each, using a chopstick or dowel. Place on baking sheets. Bake in a preheated oven at 350°F (175°C) for 10 minutes, then cover loosely with foil to prevent excessive browning. Continue baking for 12 to 14 minutes or until centers are crisp. Cool on cookie sheets until sturdy enough to move. Finish cooling on wire racks. To assemble tree, pipe icing onto outer edge of each cookie and sprinkle with pistachios while icing is still wet. When dry, stack cookies on dowel glued into hole in wooden base. Top tree with cardboard star decorated with in-shell pistachios. Cookie "clouds": Roughly 6 1/2 inches, 5 1/2 inches, and 4 inches across. Dowel: 10 inches high, 1/4 inch thick. Wooden base: 8 inches wide, with 1/4 inch hole in center. Recipe and photograph provided courtesy of the California Pistachio Board.